Sure, every old house in New Orleans has a story — and more often than not, a spooky past — but what if you want to be scared in the here and now? Fortunately, there are plenty of fantastic haunted houses in the greater New Orleans area. Read up and choose the haunt that fits your fancy (and don’t forget to wear your costume when you go). October 5-7, 12-14, 18-21, 25-31; November 2 & 3 (blackout days); 7-11 p.m. The cobwebs and monsters in the house are fake, but the cemeteries surrounding it and the ghosts inside are real. This haunted house was established in 2007 in the actual former mortuary that was in operation till 2004. The Mortuary features multiple floors, all with gruesome tableaus that include a mangled medical scene, a crypt and a bizarre circus. Through November 3; times vary (schedule). Kid Zone is open very day till October 31, 11 a.m. to 6 p.m. 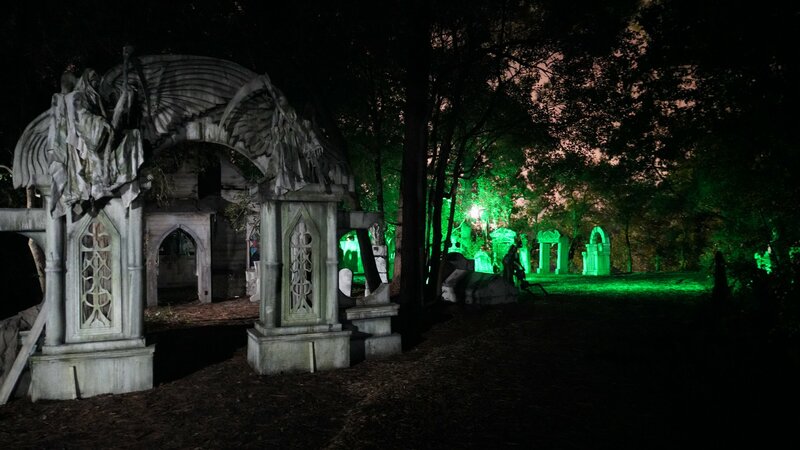 The New Orleans City Park, in partnership with the folks behind The Mortuary haunted house, debuted this outdoor Halloween attraction on the 14-acre Scout Island, a woody patch of land surrounded by lagoons. The Scout Island Scream Park cost about $2 million to produce and is bursting with creatures of the night, animatronics, and all kinds of special effects. The attraction is billed as family-friendly, but families with small children are advised to attend on the earlier side as the after-dark haunted attractions are designed for kids ages 13 and up. The “scare-free” Kid Zone on the island is designated for smaller children and has a hay maze, pumpkin patch, bounce house, and more ($15). Other attractions include carnival rides and fright zones, the interactive outdoor haunted houses with costumed actors roaming the area. The Kraken pirate pub and music hall features craft beer, food and a dance floor. You can also check out Cirque du Fear, the Horseman’s fright zone with a Sleepy Hollow theme, and the Louisiana pirate-themed Blood Bayou. All-access passes are $49 with extra a la carte prices for individual activities. This is the scariest experience you’ll ever have in a suburban strip mall (unless you participate in Black Friday). Sets and props sourced from Hollywood films and TV shows, including “Roots” and “Area 51,” are uber-realistic. Combined with costumes actors and jump-scares, they create an experience that might be too terrifying for some people ($18 at the door). This new haunted house replaced the beloved House of Shock, which closed in 2017 after 25 years. It bills itself as the largest and longest outdoor haunted attraction in Louisiana and stands on the House of Shock’s former site near the Huey P. Long Bridge. The two-story Spanish colonial mansion and courtyard has escape rooms and high-tech features throughout its attractions with creepy names like Cursed Voodoo and Museum Macabre. The haunted house doesn’t have the satanic/heavy metal themes of its predecessor, but promises to be plenty scary (and therefore inappropriate for kids under 12). Tickets start at $19.99. Looking for a kid-friendly Halloween experience (or something that won’t give you an anxiety attack)? Boo at the Zoo is Audubon Park’s annual Halloween party. There’s a costume contest, trick-or-treating, a spooky train ride, and live music. The activities are designed for kids under 12, and all games and treats are included in the admission ($20; free under 12 months). Please note that on the days of the event the Zoo will close at 3 p.m.